A mostly vintage look commemorating the transition from winter to spring (hopefully). Believe it or not, this skirt was originally an evening dress given to me by my grandmother in the hopes I might get some use out of it. Unfortunately the top (which was a beautiful charcoal gray wool) was moth-eaten beyond repair, but the bottom was still in fine condition. I took it to my favorite tailor and he whipped it into a fabulous skirt! Honestly it’s much more versatile this way. I often wear it to work and it’s fun to fancy it up with this Treasury Vintage evening bag and a vintage stole I recently scored at the thrift store. OMG Such a great way to breathe new life and love into a piece passed down to you. 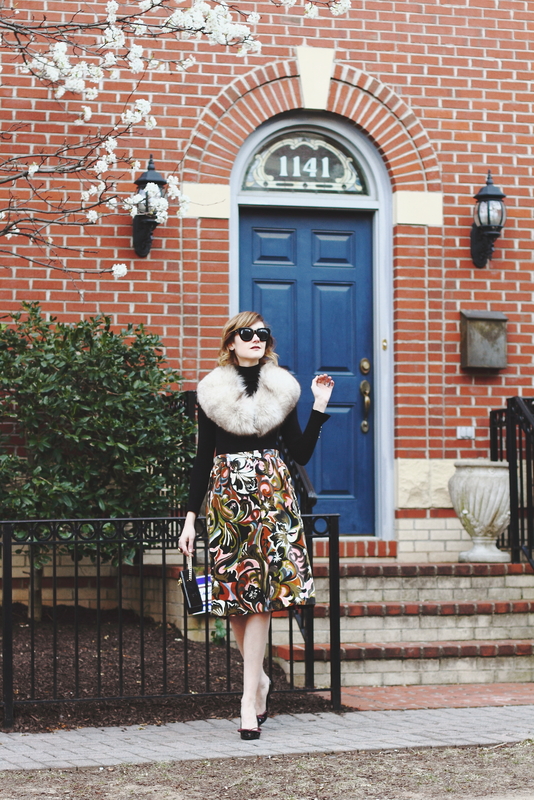 Love the print and extra vintage vibe from the fur stole. Your outfit looks fab I love the skirt the detail is so pretty! This outfit is so darling and fabulous at the same time. 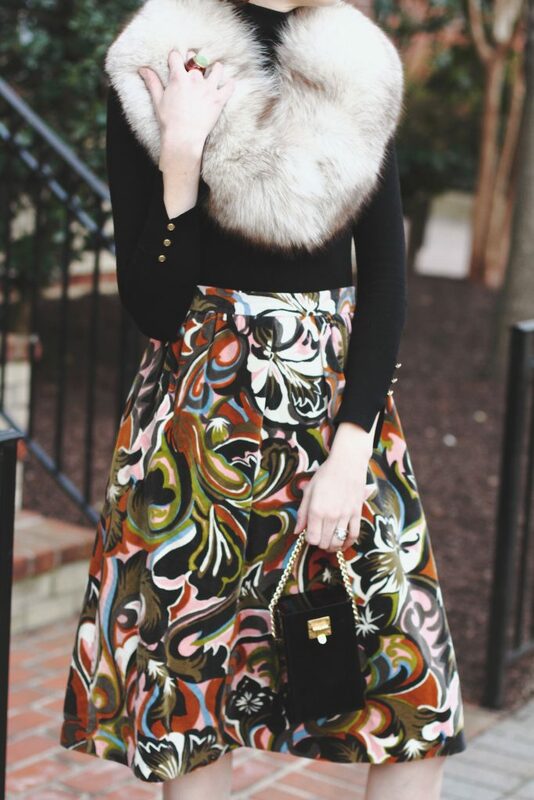 I love the skirt paired with the fur so much! This is a fabulously elegant and chic look – the fur collar is very special, as is the box bag!! This is such a lovely outfit babe! It,’s so unique I love it! And the photographs are so amazing too! This outfit is just perfect 👌🏾 Simply stunning. That vintage bag is adorable! I really like the skirt too. Wonderful that it could be made into a skirt and you could salvage some of it. Plus like you said it’s really easily worn this way rather than being just an evening dress. So gorgeous darling!!! And skirt – haha, perfect idea! 🙂 Lucky you to have a tailor! Looking absolutely unique and fabulous! I’m so in love with this look! You look so chic! Happy Monday! That skirt is a stunner! And I just fell in love with that little bag. Can you really find these beauties in vintage shops?? That skirt looks incredibly beautiful!! I really love this outfit, it looks super chic, feminine and elegant!!! So neat that this was your grandmother’s and that you were able to salvage most of it. The skirt and pattern are just beautiful. You look so incredibly chic! I adore this look! It’s so darling. What a way to revamp a piece, and I love the meaning behind it! Amazing fur scarf!! So different than the others, nice to see you dear! You look Fabulous in that Vintage dress turned into a skirt..
Gorgeous outfit!!! Love love the skirt. I have so many gorgeous bits from my grandmother, too!